According to auto recycling statistics, the car you are driving today will be a good source of many recyclable materials tomorrow when it comes time to recycle your ride. In fact, around 80 percent of a car can be recycled. It should be pointed out that a good deal of recycling takes place while your car is still in service, through automotive aftermarket recycling. Every year, over 25 million tons of materials are recycled from old vehicles. The car recycling Industry is the 16th largest in the United States, contributing $25 billion per year to the national GDP. The US automotive recycling industry employs around 100,000 people and earns around $25 billion a year. There are around 7,000 vehicle recycling facilities around the USA. Every year, automobile recycling industry in USA and Canada provides sufficient steel to produce roughly 13 million new vehicles. In the U.S., nearly 12 million cars are recycled. This number makes cars the most recycled item in the country. In Europe, every year, nearly eight million vehicles are recycled. Every year, the North American automotive recycling industry saves around 85 million barrels of oil from getting used in making new or replacement auto parts. The current international automotive recycling industry is about 75 years old. According to reports, the gross annual revenue in 1997 in USA was $7.05 billion and in Canada was $1.15 billion. In the same year, auto recyclers in USA and Canada acquired approximately 4.7 million vehicles for recycling. In that year, 6 million car tires and 11 millions of car oil were recycled. And automotive recyclers spent approximately $50 million on environmental compliance. Across North America, automotive recycling provides around 40 percent of ferrous metal for scrap processing industry. Every year, the amount of hazardous fluids and oils reclaimed safely by auto recyclers is equal to 8 Exxon Valdez disasters! Most auto recyclers are small businesses. More than 75 percent of all automotive recycling companies employ about 10 people. Automotive recyclers supply retail and wholesale customers with quality auto parts that cost 20 percent to 80 percent less than comparable new auto parts. Every year, more than 14 million tons of recycled steel in derived from junk vehicles. On an average, a car has around 25 percent of body made from recycled steel. Every year, around 27 million cars that reach the end of their useful life from around the world are recovered for recycling. Just about 80 percent of a vehicle (by weight) is recycled and the remaining 20 percent that can’t be recycled is termed as “auto shredder residue (ASR)” which includes ferrous and nonferrous metal pieces, dirt, glass, fabric, paper, wood, rubber and plastic. Every year, around 5 million tons of ASR is disposed of in landfills. In Europe, 75 percent of a car is recycled; making the ASR items 25 percent of the car. According to an estimate, in Europe, recycling facilities will recycle 95 percent of each car, by weight. Approximately 90 percent of aluminum of a vehicle is recovered and recycled. Although this aluminum recovered from old vehicle represents less than 10% the vehicle by weight, it accounts for nearly 50 percent vehicle’s scrap value. Automotive recycling industry supplies around 37 percent of all ferrous metal to blast furnaces and smelters across the United States of America. Approximately 98- 99 percent of car batteries can be recycled. But most car owners simply return their car battery to the shop from where they replace car battery. Car tire recycling is viable and material can be used to produce sandals and roadways. 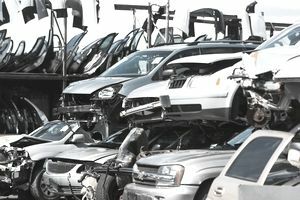 Automotive recycling reduces accident rates by buying out of order vehicles from the road and keeping roads and highways clear of disabled and abandoned automobiles. Increasingly, car windshield recycling is becoming practiced. All of the above-mentioned facts and figures about auto recycling demonstrate that the worldwide auto recycling industry a vibrant and entrepreneurial industry.